Kos is the third biggest island of the Dodecanese and an ideal destination for beach holidays and cosmopolitan experiences. Kos is connected to several destinations, both by air and by the sea. The main connections with Athens are through the port of Piraeus and the airport. Kos has three ports that connect the island to the surrounding islands. What is the main port of Kos island? The town of Kos is the main port of the island. However, ferries also depart from the port of Mastichari and Kardamena and connect the island to Kalymnos and Nisyros, respectively. Ferries that serve the route from Athens to Κοs depart from the port of Piraeus. There is at least one ferry per day during the low season, while in high-season there can be even three ferries per day that connect Athens to Kos. The ferry tickets for a deck/lounge seat are usually quite affordable. However, as the ferry trip is quite long, it is highly advisable to book a whole cabin or a berth in a shared cabin, with an extra cost that is usually less than 50€ per passenger. The ferry from Piraeus (Athens) to Kos, stops also on some of the islands of the Cyclades. Usually, there are one or two Cycladic islands that are connected to Kos. Over the years the most common connections are through Syros, Santorini, and Naxos. Regarding the Dodecanese islands, there are ferry connections from Kos to Rhodes, Patmos, Leros, Leipsoi and other smaller islands. Most of these ferry routes are served during the whole year but become more frequent during the summer season. There are several ferries per day departing from the port of Kos and from Mastichari to Kalymnos. During the high-season the ferry itineraries get really dense, providing an easy connection between Kos and Kalymnos. The trip duration is ~30 mins for ferries connecting Mastichari to Kalymnos and ~1 hour for ferries departing from Kos to Kalymnos. The port that connects Kos to Nisyros is the port of Kardamena. During summer, there may be 3-4 ferry itineraries per day performing this route. There are plenty of things to do in Kos! Quite plenty in fact! So let us just mention some of the very basic ones. Kos is a great destination to spend your summer vacations. It is an island rich of monuments, beaches, and nightlife. A tour around the island can give you the opportunity to discover its unique and stunning scenery. The island of Kos has also many natural beauties. Kos is also an island full of choices in terms of accommodation, food, nightlife, and sports. 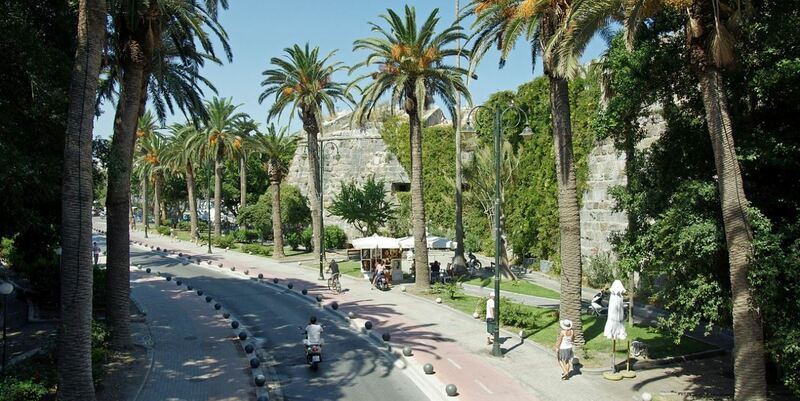 Kos is also known as the island of bicycle due to the cycle lanes around the downtown area. For this reason, there are various cycling trips one can choose to do. The whole island is full of beautiful beaches. Kos is a great place for windsurfing, horse riding, jet-skiing, and sailing. Kos is definitely a destination for all types of travelers, since the options are numerous, and the scenery is magical. How to book my ferry tickets to Kos? Getting your ferry ticket to Kos is now more than easy! Just search in Ferryhopper's ferry booking engine, and let us present you all the available ferries and routes, even the indirect ones!